So this is better than this? 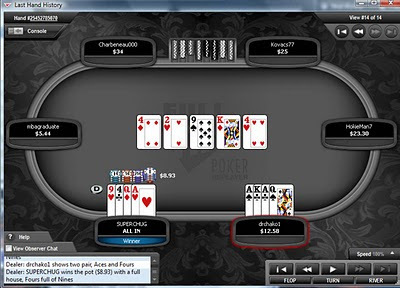 PLO players must embrace their variance, Grasshopper. Or like pounding on their thumb with a hammer, Bucko. Wash and repeat. I hate watching those hands go down in flames too but it happens. Sadly, if I had the button I would have called you pre-flop as well. Now if he re-popped pre-flop and you re-pot it and then called, tag for later use. I've been playing a lot more PLO rush lately and watching my stack bounce is the reason why I drink so much while playing. Drizz is sadly correct here. Need to play more hands on button and you sadly got outflopped. Happens.